In 1875, Brigham Young called Abraham O. Smoot to oversee Brigham Young Academy in Provo, Utah, and Smoot became the first President of the Board of Trustees. In 1876 the Academy found its first home, Lewis Hall, a two-story business building, which was converted into a classroom building. BYA opened with an enrollment of 29 students, and during the next four years grew to 272 students from Idaho, Arizona, Nevada, and nearly every county in Utah. Lewis Hall was destroyed by a tragic fire in January 1884, which forced the school to temporarily relocate to borrowed quarters. 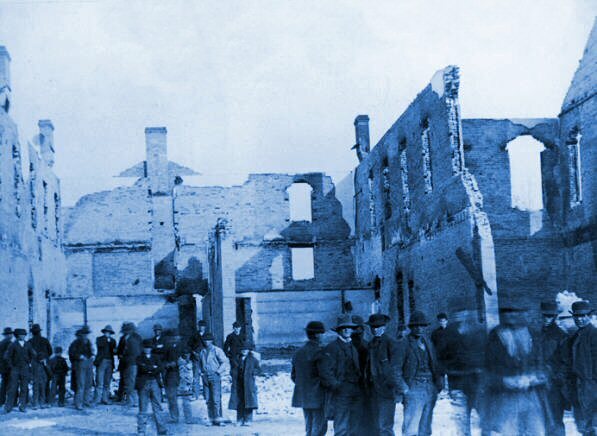 Lewis Hall, destroyed by fire in 1884. BYA in temporary quarters, ZCMI warehouse. A new campus in Provo was dedicated in 1892. 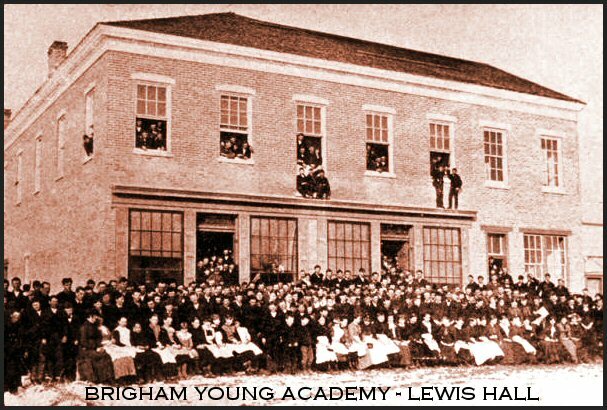 In 1903, Brigham Young Academy became Brigham Young University. The school continued to use the "Lower Campus" but it also began to develop an "Upper Campus" on Temple Hill, several blocks to the north of the Academy block. 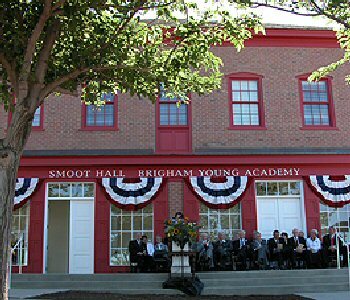 Brigham Young Academy would not have survived had it not been for the visionary leadership and personal financial sacrifice of Abraham O. Smoot. Thanks to the vision and financial support of his great grandson, Stanley M. Smoot, his wife Mary Ellen, and their family, a replica of Brigham Young Academy's Lewis Hall has been completed at This is the Place Heritage Park in Salt Lake City. The construction was launched with contributions from the Brigham Young University Women’s Conference and other donors. The main floor of Smoot Hall of "Brigham Young Academy" houses a beautiful lecture/meeting hall where a virtual tour of This is The Place Heritage Park is shown. The administrative offices for the Park are located on the second floor. • A fully-equipped Family Search Center for researching genealogy. • Stories By Me! offers visitors the opportunity to create personalized books to capture meaningful events in their lives or the lives of relatives and friends. Another option allows visitors to create a book where they become a 19th century pioneer. • Using the latest in digital filmmaking, a program called Hearts of the Children provides all of the resources needed to capture the life stories of any member of their family, even ancestors. This DVD may include interviews, pictures, music, recreations — visitors are only limited by their imagination! Hours for this resource are posted on lower level of Smoot Hall. The address for This is the Place Heritage Park is 2601 East Sunnyside Avenue, Salt Lake City, Utah. The Park's telephone number is 801-582-1847. As the first building to house the Brigham Young Academy in Provo burned to the ground in 1884, Utah's future U.S. senator, Reed Smoot, stood next to Karl G. Maeser, the Academy's first professor, and mourned the end of the fledgling school. 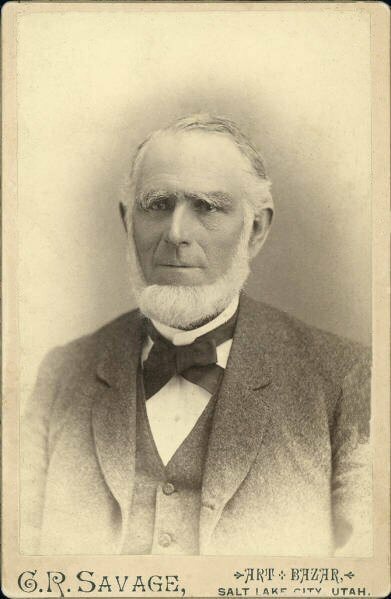 The older and wiser professor politely informed Smoot — whose father, Abraham O. Smoot, would spend his fortune keeping the school afloat — that it was simply the end of what was known as the Lewis Building, which had been donated by LDS Church President Brigham Young as the foundation for the Academy. A replica of that building was dedicated Wednesday morning, July 21, 2004, at This Is the Place Heritage Park, largely as a tribute to the foresight of Maeser and the elder Smoot. Hundreds of area residents attended the hour-long, outdoor dedication ceremony under sunny skies, as temperatures approached 90 degrees. Before dedicating the building, President Gordon B. Hinckley of The Church of Jesus Christ of Latter-day Saints read from the diary of his father, Bryant S. Hinckley, who was among the first students to attend Brigham Young Academy. He also praised the Stan and Mary Ellen Smoot family and Abraham Smoot for their contributions, past and present. "I don't know of any individual in the church who has given more, other than those who gave their lives," he said, referring to Abraham Smoot's dedication to the establishment of the Provo academy. 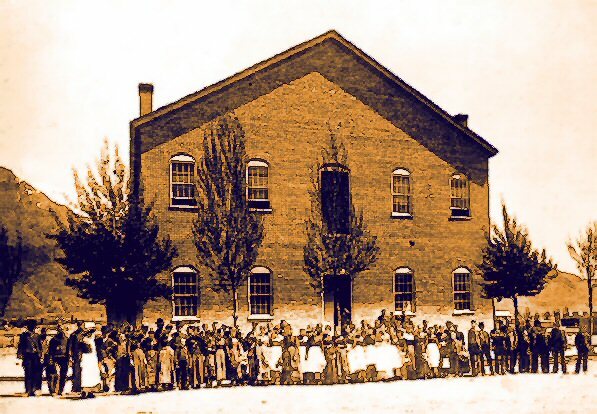 Smoot was a wealthy businessman asked by Brigham Young to help Maeser found the school, and Smoot died virtually penniless in his effort to help it succeed. President Hinckley called the replica of the Lewis Building a "very significant memorial" to the desire of early Latter-day Saints to become educated not only in spiritual subjects, but in secular learning as well. Elder Merrill J. Bateman of the presidency of the Quorums of Seventy, former president of Brigham Young University, praised both Smoot and Maeser, saying the latter had had a dream years before the Provo academy's first building burned down, in which Brigham Young appeared to him and showed him a very distinctive building. Maeser was so impressed by the structure that he awoke to sketch it and then put the drawing aside. Once the Lewis Building burned down, Elder Bateman said, Maeser's sketch was used as the basis for the reconstructed academy building, which now stands restored in Provo. BYU grew out of the Academy's 19th-century roots and now ranks among the largest private institutions of higher learning in the nation. Elder Bateman joined President Hinckley and park administrators in thanking Stanley and Mary Ellen Smoot, who were approached several months ago about funding a half-million-dollar completion of what will now be known as Smoot Hall at Brigham Young Academy. After considering the request for a short time, the Smoots agreed to not only put their resources behind the project but made suggestions for additional features. The building now houses an innovative Family Search Center for family history enthusiasts on the lower floor, complete with new software that "interviews" visitors and — based on their responses — compiles individual short stories into a soft-cover bound book. The main floor is comprised of a large meeting/lecture hall that will seat 250 to be used for a variety of events. A small theater will show a video tour of This Is the Place Heritage Park. Administrative offices for the park will be housed on the upper floor. Paul Williams, President and CEO of This Is the Place Foundation, was one of the principals to approach the Smoots for help in completing the building, the shell of which had already been constructed with funds generated by the BYU Women's Conference. Stanley Smoot is a great-great-grandson of Abraham O. Smoot, and his wife is a former general president of the LDS Relief Society. The couple told those assembled Wednesday that the endeavor meant a great deal to them and their extended family, and they hope the new building will help draw additional visitors interested not only in Utah's pioneering history, but in their own family history as well. Music for the ceremony was provided by the Smoots' children and grandchildren.